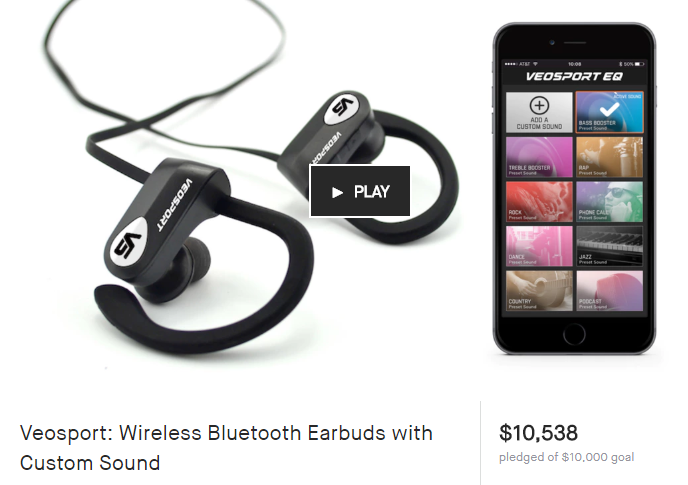 The Veosport team set out to create Bluetooth Headphones with the best wireless listening experience possible. We're a Northern California company with our headquarters located in Sacramento, CA. We have a passion for sports, fitness, MMA, and entrepreneurship. We have a passion for sports, entrepreneurship, mma, traveling, music, and hiking. In July 2017 they set out to create a quality and affordable Bluetooth earphone to match our lifestyle. After a successful Kickstarter campaign we went into production for the Veosport V1's. They are now available in black, white, and soon red! We look forward to creating awesome Bluetooth products to help you have a great experience in whatever you do. The V1's were designed to be an in ear sport headphone. We created a quality sport headphone without compromising on sound and style. In August 2017 we launched the V1's on Amazon. The first feature is comfort. The V1's offer 8 ear tips options including 3 sizes of foam earbuds, 3 sizes of silicone earbuds, and two sizes of triple flange earbuds. Secondly, the Veosport headphones have a crisp quality sound, but you can take it a step further and download the Veosport EQ app to adjust the sound settings of your V1's. Lastly, the V1's have a sleek matte finish and wrap tightly around your ear. Veosport creates media content and increases headphone production to start selling on veosport.com. This started with multiple photo shoots, video shoots, and product photography. See our video here with Onnit athlete and former Miss Texas, Whitney Miller. Veosport is staring an ambassador program with influencers to represent the Veosport brand. Veosport is looking for representatives in the sports, fitness, mma space. These athletes and fitness enthusiast know the power of music to get you through your workouts. Listening to your favorite music or podcast helps you stay motivated during your training and we can help. Some of the athletes Veosport has worked with include Dustin Poirier, Whitney Miller, and Urijah Faber. Veosport plans to add 15 athletes as ambassadors. Since the beginning Veosport has show a strong interested in the MMA space. After working with a few fighters it made since to partner with local legend, Urijah Faber. Urijah enjoys using the Veosport V1's, and after meeting with the Veosport team he signed on as managing partner. Veosport is now the official headphone of Team Alpha Male. Veosport is excited to see where this partnership goes.